Production photos from New Line Theatre's OUT ON BROADWAY: THE THIRD COMING in 2017. All photo credits: Jill Ritter Lindberg. These images are provided for use in the promotion and news coverage of this production or of New Line Theatre. Credit for this image must be given to New Line Theatre and to the photographer listed whenever possible. For images appearing in online publications, the courtesy of a link to New Line's website at http://www.newlinetheatre.com is requested. Copyright on all images is held by New Line Theatre unless otherwise indicated. 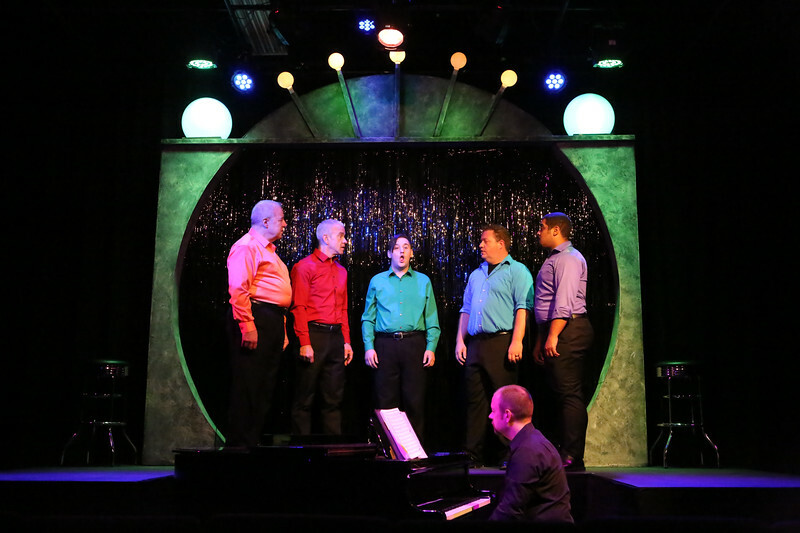 Ken Haller, Keith Thompson, Sean Michael, Mike Dowdy-Windsor, and Dominic Dowdy-Windsor, singing "Everything Possible," with Nate Jackson on the piano, in OUT ON BROADWAY: THE THIRD COMING, New Line Theatre, 2017. Photo credit: Jill Ritter Lindberg.